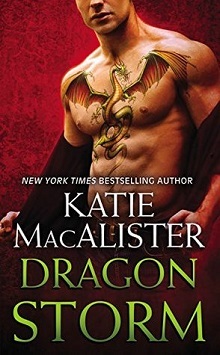 The second in the Dragon Falls series, this book focuses on Constantine, who we met in the Light Dragons Series. He’s got a bit of a squidgy reputation since giving his all for another years ago, and has rather reveled in that loneliness and fear that come with that reputation. Now he’s intrigued with Bee, Aiofe’s sister who was instrumental in the difficulties Aiofe was experiencing. She was a bit of a ‘know it all’, and in MacAlister’s stories – those girls always have a massive ‘come to the light’ moment when truths are revealed. We get to see Bee confused, confounded, frustrated and off balance as Constantine weaves his special blend of arrogance and protectiveness with a dash of self-important ‘ME” all around her. To say she is often left without a stinging retort that hits the mark is not an understatement. Slowly these two start to bond (ok, for Constantine it wasn’t all that slow) and as Constantine’s story is revealed we start to see his own challenges right along with Bee. With threats to Bee, even as he is reeling from her particular ability to communicate and see him, even in his spirit form, he pulls out all the stops – determined to rise above the walls that constrain and contain his actions and moves him into love. A wonderful mix of romance, mystery, growth and a chance to enjoy another few hours in the worlds MacAlister has created. Narration for this story is provided by Tavia Gilbert, and her style is wonderfully facile, adapting to the strange names, accents and deliveries with flair. These cannot be easy to narrate – the sly asides and comedic nature of some comments placed in a story that is both tension-filled and slightly mysterious require an awareness of those moments, not to highlight them, but to present them as they are written, without hesitation that would signal ‘laugh here’. Moments that are heavier in emotional impact also require gentle handling to not overwhelm the story, and Gilbert managed to avoid all the pitfalls and create a listen that draws you in, making the story an easy listen. A wonderful story to read or listen to – and yet another in the long list of titles you should read from Katie MacAlister. « Armchair BEA 2016 – And now- the end is here! This is the second narrator (or perhaps even third) that I’ve heard narrating Katie’s books – each one brings something different and special to the story – and, I like the ability of listening and just immersing myself in the story. Thanks for stopping in!